To control anxiety, depression, and/or insomnia without drugs in just 20 minutes every other day. Use it while reading, working at your desk, or watching TV! The Alpha-Stim SCS treats anxiety, depression, and/or insomnia with tiny electrical currents similar to those found naturally in the body, using a method called cranial electrotherapy stimulation (CES). The treatment is simple. The current is applied by easy-to-use clip electrodes that attach to your ear lobes. solution,and attach them to your earlobes. Press the left-hand button to switch on, and press the right-hand button to select 20 or 60 minutes. Adjust the intensity of the stimulation using the dial on the side. You may feel a slight tingling sensation under the electrodes, but it is not necessary to feel this in order to achieve results. Most people feel nothing at all except positive results. How can the Alpha-Stim SCS help? The Alpha-Stim SCS empowers you to control your anxiety, depression, and/or insomnia. Used just 20 to 60 minutes every day, every other day, or on an as-needed basis, it can help induce a relaxed state and enable the user to focus attention on the task at hand. The Alpha-Stim SCS is well tolerated and very safe in contrast to drugs, many of which have been proven to have undesirable side effects and can be addictive. The Alpha-Stim SCS leaves the mind alert. The person undergoing CES treatment will often report a pleasant, relaxed feeling of well-being. Anxiety reduction is usually experienced during treatment, but may be seen hours later, or even the day after treatment. Depression and insomnia control is generally experienced after one to two weeks of daily treatment. Maintenance of a relaxed, yet alert state is generally achieved with treatments three times per week. 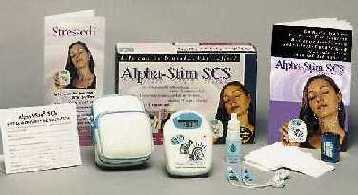 As a result, the Alpha-Stim SCS is suitable for clinical or home use. What scientific research has been conducted? At present, there are over 125 research studies on CES in humans and 29 experimental animal studies. The overwhelming majority of the scientific research is extremely positive. No significant lasting side effects have been reported. Harvard University School of Public Health, Department of Health Policy and Management found: "The meta-analysis of anxiety showed CES to be significantly more effective than sham (P<.05)." (Meta-analysis of randomized controlled trials of cranial electrostimulation: efficacy in treating selected psychological and physiological conditions by Dr. Sidney Klawansky et al. Journal of Nervous and Mental Disease, 183(7):478-485, 1995. Results of using Alpha-Stim technology by physicians. For additional information see the book: The Science Behind Cranial Electrotherapy Stimulation, 2nd Ed. by Dr. Daniel L. Kirsch. Medical Scope Publishing Corporation, Edmonton, Alberta, Canada, 2002. Results of using Alpha-Stim® technology at home for a minimum of 3 weeks. For additional information see the article: Is microcurrent stimulation effective in pain management? An additional perspective by Dr. Ray B. Smith. American Journal of Pain Management, 11(2):62-66, 2001. *N refers to number of patients. [CES] sounded like something both interesting and desirable to me, which is why I was sitting there beside the Alpha-Stim with those electrodes clamped to my earlobes... The machine was turned on, and I felt a tingling sensation of tiny pinpricks in my earlobes, as a few microamps of 0.5 Hz passed into my brain... the shift in consciousness was quick and unmistakable. My body immediately felt heavier, as if I was sinking down into myself. I realized I was becoming extremely relaxed, and all of a sudden, there I was. It was that feeling you get when all at once you blink your eyes and realize that you’re awake. Not that you had literally been sleeping, but you hadn’t been paying attention to things as carefully as you might, you had been sleepwalking through your day, and now you’re awake and things are very, very clear. It was not a feeling of being in some strange stoned or otherworldly state, but rather a feeling of being exactly as you should be, at home in yourself a feeling that your brain was operating correctly, efficiently, clearly.... My body was no longer heavy, but very light, full of energy. The feeling was one of openness, clarity, as though I had been wearing sunglasses for weeks and had suddenly taken them off. It was no big thing. Nothing special, really, except I couldn’t help but feel that this is the way were supposed to be all the time. From the book Megabrain by Michael Hutchison, Ballantine Books, New York, pages 125-126. This is everything necessary to begin to use the Alpha-Stim SCS for management of anxiety, depression and/or insomnia right away. Each Alpha-Stim SCS is warranted to be free from defects of workmanship and materials under normal use for a period of five years except for replacement of batteries and accessories. See Owners Manual for complete details. CE conformity statement for Europe: The Alpha-Stim SCS is a Class IIa, Type B medical device. It has been independently tested by outside agencies in order to provide assurance of conformity to applicable standards for medical equipment safety and electromagnetic compliance. Caution statement for United States: Federal law (USA only) restricts this device to sale by, or on the order of, a licensed health care practitioner. Outside the USA it is available world wide without a prescription but consultation with a qualified health care professional is recommended for difficult and unresponsive problems or when used with pharmaceuticals or other therapeutic intervention. Indications: Alpha-Stim cranial electrotherapy stimulation (CES) technology is continuously being subjected to rigorous study and evaluation by the international medical community. Findings to date indicate that the Alpha-Stim SCS is an effective treatment with broad applications for a variety of anxiety disorders, or for the short term relief of the symptoms of anxiety, depression and/or insomnia. In many cases it is the sole therapeutic method required. As with any therapeutic intervention, not all people will respond to the Alpha-Stim SCS. The degree of efficacy will vary with the nature of the problem being treated and the overall health of the person. Contraindications: Alpha-Stim SCS may affect the operation of cardiac pacemakers (particularly demand type pacemakers). Precautions: For external use only. Do not allow children to use or handle this device without adult supervision. Do not operate potentially dangerous machinery or vehicles during, and in some cases, for several hours after treatment. Safety of stimulation has not been established during pregnancy. There have been isolated reports of blood pressure being lowered by CES so care should be taken while using the Alpha-Stim SCS with high blood pressure medication. Adverse effects: Adverse effects are usually mild and self-limiting. Adverse effects seen in approximately 4,541 patients in controlled, open, uncontrolled conditions, and by physician survey and reasonably associated with the use of CES are dizziness (6 cases, 0.13%), skin irritation/electrode burns (5 cases, 0.11%), and headaches (9 cases, 0.20%). Prolonged CES treatment at higher than necessary currents may cause dizziness or nausea that can last for hours to days. Treatment immediately prior to going to sleep may cause difficulty sleeping due to increased alertness. 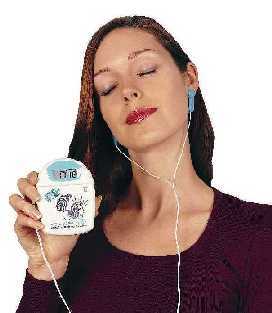 It is recommended that CES be used at least 3 hours before going to sleep. Paradoxical reactions such as hyperexcited states, increased anxiety, and sleep disturbances may occur. If the Alpha-Stim SCS does not control your anxiety, depression and/or insomnia within 3 weeks, discontinue use and consult your physician. The Alpha-Stim� SCS (Stress Control System) cranial electrotherapy stimulator treats anxiety, depression, insomnia and other stress related disorders. Comes complete with one set of CE-2B ear clip electrodes, 200 felt electrode pads, 15ml Alpha Conducting Solution�, one 9v battery, genuine leather carrying case, and an illustrated Owner's Manual in English. Multi-lingual Owner's Manual also available. Prescription required in the USA only.